It is summertime and for some that means camping, fishing, and grilling. 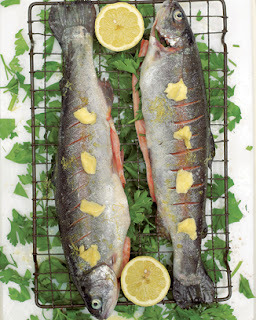 I discovered this recipe for grilled trout with parsley and lemon on Jamie Oliver's website. I liked it because it had minimal ingredients and seems pretty healthy (not too much butter or oil). The recipe calls for cooking under a broiler (or "grill" as they say in the UK) but I wonder how this would taste on the grill in the backyard. Feel free to experiment with different seasonings too. Please remember to look for sustainably fished seafood when you go shopping. More info can be found on the Marine Stewardship Council's website. 1. Preheat your grill (broiler) to full whack. 2. Slash each trout with a knife, about ten times on each side. Each slash should be about 0.5cm/¼ inch deep. 3. Rub the trout with olive oil and season with salt and pepper. 4. Stuff the cavities with plenty of chopped parsley and the lemon slices. 5. Place the fish side by side on a baking rack over a roasting tray. 6. Put the lemon zest on top of the fish and place the lemon halves on the tray too. 7. Dot the trout with the butter and place it 15cm/6 inches from the grill. 8. Cook for around 6 minutes on each side until crispy and golden. 9. Squeeze the roasted lemon over the top of the fish and serve with a simple crunchy side salad.